What makes the elephant charge his tusk, in the misty mist or the dusky dusk? What makes the muskrat guard his musk? Courage! What makes the sphinx the seventh wonder? Courage! What makes the dawn come up like thunder? Courage! What makes the Hottentot so hot? What puts the "ape" in apricot? What have they got that I ain't got? Courage! - The Cowardly LionNeed a lil’ bit of courage this Halloween? 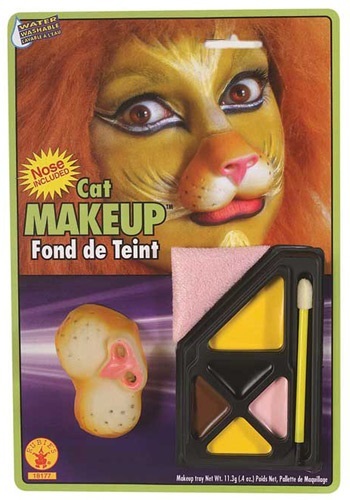 Then try the Lion Face Makeup Kit! With just a few strokes of the the yellow, brown, and pink makeup palette, the Lion Face Makeup kit is a super easy and fast way to add some character to your Cowardly Lion costume! We ain’t “lion” (geddit?) - a painted face is the perfect way to add an extra playful touch to your favorite timid jungle cat! It’s so easy, even a mouse can do it! You'll be off to see the Wizard in no time!